On Monday, Judge Margaret Sweeney removed the protective order on seven of the tens of thousands of documents covered by it that have been produced during discovery in lawsuits brought before her in the United States Court of Federal Claims. Just these few were enough to show that Treasury has not been truthful in two critical areas relating to the conservatorships of Fannie Mae and Freddie Mac. First, they make clear that Treasury knew the companies were about to report a large jump in profitability at the time it “agreed” with FHFA to replace Fannie and Freddie’s 10 percent dividend requirement with a net worth sweep, taking all of their net income in perpetuity. Second, they leave little doubt that contrary to black letter law it has been Treasury, not FHFA, which has been calling the shots on virtually every key decision related to the companies since they were put into conservatorship (at Treasury’s initiative) in September 2008. The fact that Treasury has not been truthful about its actions related to the takeovers of Fannie and Freddie and its subsequent management of the companies will come as a shock to most. But this deception and dishonesty is more understandable when placed in the context of the near two decades-long battle between supporters of Fannie and Freddie and members of what I call the Financial Establishment—large banks and Wall Street firms, and their advocates and alumni at Treasury and elsewhere—for control of what now is a $10 trillion financial market (and was an $11 trillion market before the housing collapse and the nationalization of Fannie and Freddie). I covered this battle in detail in my book, The Mortgage Wars, calling it “a no-holds-barred fight among giant financial institutions and their regulators over who would have the dominant position in this market—and the profits that went along with it.” In a fight this fierce not everyone plays by the rules, and Treasury, as now is apparent, has been one that has not. In earlier stages of the mortgage wars, Treasury and its partner in the fight, the Federal Reserve, made decisions and took actions that were unwise but not improper or illegal. These included declining to regulate risky subprime lending practices, and changing bank risk-based capital rules to give private-label securities (PLS) the same risk weights as Fannie and Freddie mortgage-backed securities in spite of the obvious differences in the nature and structure of the credit protection offered by each. The combination of risky primary market loans, no effective discipline on what could be financed in PLS, and the Wall Street risk-shifting (or -disguising) innovations of collateralized debt obligations (CDOs) and synthetic CDOs produced the housing boom and bust that followed. When the PLS market imploded in the fall of 2007, rather than admit that the Financial Establishment’s goal of substituting private market capital for financing by Fannie and Freddie was dangerously misguided, Treasury doubled down on it, using the impending financial crisis as a pretext to disguise a takeover of Fannie and Freddie as a rescue, then installing a conservatorship that it, through FHFA, illegally managed with terms and actions designed to prevent the companies ever from emerging from that conservatorship. At the same time, and against all factual evidence, opponents of Fannie and Freddie successfully promoted the myth that these two companies—not unregulated, undisciplined and careless private market participants—were the ones to blame for the calamities in the mortgage and housing markets. We’re now in the late stages of the mortgage wars, and little has changed. The Financial Establishment still is attempting to get rid of Fannie and Freddie and replace them with “private sources of capital,” asserting that this will be in the best interests of all. Indeed, their latest plan for the future of the mortgage finance system was laid out just three weeks ago: it is the Parrott, Ranieri, Sperling, Zandi and Zigas “A More Promising Road to GSE Reform” proposal. What gives this away as the Financial Establishment’s plan is that two of its core elements—the common securitization platform being developed by Fannie and Freddie and the companies’ undertaking a series of large, programmatic securitized risk-sharing transactions—have been well underway for years, at the instigation and under the direction of Treasury and its captive conservator, FHFA. As I noted in an earlier post, it’s astounding that the authors of “Promising Road” would again propose to replace a secondary market mechanism that has been proven to work—relying on specialized companies such as Fannie, Freddie and the mortgage insurers to grade, price, diversify and manage mortgage credit risk—with anything remotely resembling the disastrous experiment of a decade ago of basing a ten trillion dollar market on the ephemeral investment preferences of leveraged capital markets investors with no particular mortgage credit risk appetite or expertise. While financial institutions that back and benefit from such an approach may wish to try that again, few if any others should—particularly homebuyers, who were burned so badly the last time. Financial Establishment advocates for the “Promising Road” and earlier comparable plans justify their proposed elimination of Fannie and Freddie—or the requirement that the companies hold bank-like levels of capital that would render them ineffective if they were allowed to survive—by saying that while their recommendations may raise the cost of mortgages for homebuyers, they “protect the taxpayer.” Yet with nearly two-thirds of taxpaying households owning their own homes, more often than not the taxpayer and the homebuyer are the same person. It therefore is incumbent to ask, “who is being protected, from what, and at what cost?” Asking and answering that question, it becomes evident that most Financial Establishment reform proposals impose large and certain costs on the homebuyer/taxpayer to protect against risks that if differently structured, regulated and managed would have much lower costs for them, if any cost at all. To illustrate this point, we can examine how the homebuyer/taxpayer fares under the regime I outlined in my proposal, “Fixing What Works,” compared with one in which Fannie and Freddie, or some new entity or entities, are required to hold 4 percent capital and pay an additional 10 basis points to insure against the possibility of credit losses greater than what the entities can cover with their capital and guaranty fees. In my proposed regime, Fannie and Freddie would hold capital sufficient to protect against a 25 percent nationwide decline in home prices. Given their current mix of business or anything similar, and a 10 percent capped return target, Fannie and Freddie would charge about 40 basis points (before temporary payroll tax and affordable housing fees of 14.2 basis points) to guarantee a homebuyer’s mortgage. With 4 percent capital, a 10 basis point catastrophic risk premium, and pricing to a 12 percent return target, a guarantor would have to charge about 90 basis points (before the other fee add-ons). There is no “risk to the taxpayer” in my proposed system, because the government would agree to provide short-term repayable support to the companies should their capital ever prove inadequate. And while my system does have moral hazard, it is greatly reduced by the limited returns the companies would agree to and by the conservative stress standards they would be required to meet, in exchange for the government backstop. Moreover, officers of the companies, as well as their shareholders, would have strong incentives to manage their affairs properly and prudently. Because the capped returns are set at pricing, the companies would retain any excess if the loans perform better than expected. And officers and shareholders each would suffer great hardships should the company in fact require short-term assistance. Top executives would lose their jobs, and the value of their and shareholders’ stock would plummet. In addition, the companies would have to replace the capital they lost by issuing new shares of common stock at very low stock prices, badly diluting the value of existing shares, even after the companies recover. It wouldn’t be a difficult decision. The homeowner/taxpayer, however, doesn’t have a say in what they’ll get, while the Financial Establishment does. That’s why we don’t yet have a sensible and workable system, and why we still could end up with another disaster. I must say this is the best blog going to discuss the GSE’s. Thank you Mr. Howard. Expect this blog to explode with traffic soon. Did you hear the old saying “if you can’t defeat them join them”? Do you think that may happen here? I mean that the enemies of the GSEs end up buying the shares and owning the companies? It will be a lot cheaper for them and they will enjoy the profits that they are looking for. Does it makes sense, or I am totally wrong? You should not expect Fannie and Freddie’s opponents to attempt to take stakes in the companies. The companies’ opponents don’t want a share in the profits Fannie and Freddie could make as private entities– those profits are modest compared with what the big banks and Wall Street firms earn– they want Fannie and Freddie constrained or eliminated, so that these same financial institutions can make far higher profits through gaining control of the secondary mortgage market. Seems like a pipe dream with Fannie growing and moving into a new office. Don’t you think? The “input” I have on this may not be what you’re looking for. There are many postings on message boards by people using pseudonyms claiming that facts or data they’re not too familiar with, don’t quite understand and can’t seem to explain nonetheless have important implications for some reason or other. If I were you I wouldn’t pay much attention to them. You’re better off getting your information from people who use their own names, have credentials you can evaluate, and who defend their statements and conclusions with facts rather than speculation. Many good people want to remain anonymous but may have good hunch or facts or connect things to make sense of what may appear as puzzle. These things needs to verified with experts like you and who also who have credibility. In FnF case, this is how most things have worked. Fair enough, but any anonymous person also needs to present their hunches or potential findings in a way that might lead an expert to want to take the time to try to flesh it out or verify it. The majority of things I’ve seen on message boards don’t meet that standard, unfortunately. Thanks for your willingness to be open about this and help the right cause. Peace! And thanks for a response. Just seeing if something sticks and you seem to be the best one to try and answer this question. Thanks for your time! What are your thoughts on Fannie and Freddie posting losses this qrt? Do you think they will? Hopefully if they do the public will blame the government for this one because of lack of capital. Especially if they need to draw from treasury to cover the loss. Let me start by saying that I don’t have any specific insight into either company’s first quarter financial results. I also haven’t done a detailed analysis of either’s earnings volatility, but have noted that Freddie’s has been greater since the net worth sweep. I suspect that’s because both companies’ earnings volatility stems mainly from hedges on loans held in portfolio, and the relative size of Freddie’s portfolio compared with its assets (about 18%) is considerably larger than Fannie’s (about 12%). For that reason, if either company were to post a loss this quarter, my guess would be Freddie. As I discussed in an earlier post (“Some Context, and the Coming Bailout Charade”), however, this is an artificial situation deliberately engineered by Treasury to attempt to generate momentum in Congress for shutting down the companies and replacing them with a more bank-centric form of secondary market financing. Treasury certainly understands that the companies’ quarterly results are heavily affected by accounting volatility arising from the fact that GAAP requires them to use historical cost accounting on some of their assets, and fair value accounting on others. In designing the net worth sweep, it could have left the companies with a capital reserve large enough to handle that quarterly volatility. Instead, it cynically chose to leave them with the equivalent of a burning fuse. Both companies were allowed to retain a $3.0 billion “applicable capital reserve” at December 31, 2013, but at Treasury’s instigation that reserve was required to be reduced by $250 million per quarter until it reaches zero on December 31, 2017. That was Treasury’s way of saying, “if you [the Congress] don’t give us what we want, we’ll blow these companies up!” I hope both the Congress and the media are smart enough to see through this deceit, but we’ll see. 1) The retained portfolio doesn’t have any gains, so valuing at cost is correct. If the portfolio had any gains — why aren’t the GSEs unloading them at a profit? 3) Even if the GSEs were able to use hedge accounting (which they can’t because of the stunts pulled by Parseghian & Co. at Freddie), the cash still has to be paid out the dealers. Barry: Your comments are not “accurate;” they either are off base or irrelevant to the question I was asked. For the benefit of other readers, I’ll briefly respond to your three statements: (1) The correct valuation method for the companies’ portfolios has nothing to do with whether they have gains or losses: GAAP requires some assets or liabilities to be valued at historical cost, and others to be valued at market; (2) reported derivative costs have two components, (a) amortization of premium (which reflects the “transfers of cash to dealers” you reference, is known at the time the derivative is entered into, and is not part of the temporary accounting volatility I address in my comment above) and (b) temporary fluctuations in the market value of those derivatives, which net to zero over their lives but do affect net income in the interim; (3) no one is suggesting that Fannie or Freddie ignore derivatives costs in their financial statements, whether they use hedge accounting or not. There is confusion about FnF’s use of hedging strategies. Judges also raised some questions about hedging losses. Can you use please explain FnF’s use of hedging strategies? You raise a good point about hedging strategies and costs. Both Fannie and Freddie extensively and actively hedge the interest rate risk of their mortgage portfolios. I like to think of interest rate risk management as having two basic elements (and costs): (a) the initial transactions put on the books (and the costs incurred) to create a reasonable match between the mortgages purchased and the debt and derivatives, including options, used to fund those purchases, and (b) the ongoing costs of “rebalancing” those assets and liabilities to keep them reasonably well matched as interest rates move. The amount of rebalancing required for either company’s portfolio depends, in turn, on two things: the amount and type of initial hedging done, and the degree of movement of interest rates over the life of the mortgages owned. When I was at Fannie we did extensive modeling, using hundreds of scenarios of interest rate changes, to guide us in deciding (a) the optimal mix of debt, derivatives and options to use to fund a mortgage at time of purchase and (b) the amount of initial spread we needed to cover our expected future rebalancing costs and still end up with our target return on investment. Once the loans were on our books and financed, their profitability depended on interest rate movements. No matter what we did to rebalance, if interest rates were less volatile than the average assumed at time we purchased them those loans would have better than average profitability; if interest rates were more volatile the loans would be less profitable. Over time, though, we found that the size of our portfolio, and its diversification over time, caused these fluctuations to even out, so that the profitability of the portfolio as a whole was relatively stable, even if interest rates were not. So– Fannie and Freddie do hedge their mortgage portfolios, and it’s a good thing. It benefits shareholders (and, indirectly, the taxpayer) by making the companies’ net interest income more stable. At the risk of over-complicating things, I’ll make one final point for the sake of attempted clarity. There are instances in which, in response to movements in interest rates, either Fannie or Freddie may choose to rebalance its mortgage portfolio by terminating an existing derivative contract. If and when that happens, it technically results in a “hedge loss.” That type of hedge loss is an ordinary cost of doing business–just as is the cost of extending debt maturities when interest rates rise–and unlike the hedge losses caused by interest rate volatility on derivatives that are held to maturity, which net to zero over their lives, realized derivative losses from portfolio rebalancing obviously don’t come back in the future. Thanks for for explaining FnF hedging strategies. Your knowledge, experience and willingness to explain these complicated things greatly benefits all. hey Tim I have another question about the 11,000 documents. Some media is comparing it to Nixon case. Do you think that this can lead to an scandal similar to Nixon’s? or this is just a minor business compared with Watergate? I don’t think the Watergate analogy is apt, but I also wouldn’t call what’s gone on with Fannie and Freddie “minor business.” I believe Treasury (and FHFA) have broken the law, and are continuing to do so on a very large scale. Should the courts agree– and should there be documents produced in discovery and ultimately unsealed that are troublesome or incriminating for some officials–then the story of the government’s treatment of Fannie and Freddie, and its efforts to keep that treatment from being widely known, may well rise to the level where the public views it as a scandal. But it won’t be “Nixonian”; it will get its own label. yes , I agree it is not a “minor business’, I meant a different kind of business not minor. Hi Tim, can you tell us ,in your opinion, what will happen with the 11,000 documents that the gov don’t want to show? Eric: I can give you my guess on that, but first let me clarify for readers what we’re talking about, since there has been confusion about this on other sites and in some news articles. So far in the discovery permitted by judge Sweeney in the Federal Court of Claims case, there have been tens of thousands of documents produced– probably over a hundred thousand– all of which are covered by a protective order. Under that order, plaintiffs’ counsel and individuals retained by plaintiffs’ counsel who have signed an agreement to abide by the protective order (a number that now totals around 300), can see the documents, but no one else can– not even the plaintiffs themselves. This means that people like Bill Ackman and Bruce Berkowitz, who are funding the lawsuits, haven’t been able to see, or give their analysis of, ANY of the documents produced in the Court of Claims discovery. Judge Sweeney unsealed seven of those documents on April 11, so that counsel in the Perry Capital appeal could cite them in oral argument on April 15. The 11,000 documents you refer to are different. These are documents the government hasn’t yet given and doesn’t want to give to anybody– even plaintiffs’ counsel. The government’s argument is that they contain information so sensitive to the financial markets that they should be kept confidential indefinitely. Plaintiffs in the Court of Claims case have filed a motion to compel the government to produce some or almost all of these documents, and judge Sweeney will shortly rule on that motion. As we could tell from the language judge Sweeney used in ordering the unsealing of the seven documents prior to the Perry Capital appeal, her patience is running thin on the government’s use of the deliberative process privilege to delay or deny the production of documents requested in discovery. I have no inside information–and deliberately have not asked any of the plaintiffs’ counsel for their opinion on this issue– but I am confident that judge Sweeney will give plaintiffs a clear victory on their motion to compel. In that motion, plaintiffs’ counsel presented a menu of ten actions Sweeney could take, with the most sweeping being to “order Defendant to re-assess all of its privilege claims in light of the Court’s decision and to produce all documents that are not genuinely privileged.” She may not go that far– although I wouldn’t be shocked if she did– but I believe the ruling she does make will be viewed as falling between “favorable” and “aggressive” on the side of the plaintiffs. Thank you Tim. Keeping us informed is very appreciated. So the way I understand it, the MTC is referring to the yet to be produced 11000 documents. So what will happen to the the rest of these documents that were produced but are under protective orders? Will they be unsealed by Sweeney? I did not see any plaintiffs requesting them to be unsealed. Even if the MTC is granted, wouldn’t they be filed under protective orders as well? At what point will all these documents be unsealed. Plaintiffs are and will be ammending their initial complaints. If they are not able to see these documents (only their Lawyers do) how would they make a more relevant or potent complaints? Starting with the motion to compel (MTC), yes, any documents judge Sweeney orders to be produced in response to the MTC will be covered by the protective order and thus remain sealed for everyone but plaintiffs’ counsel and their consultants. (But remember, plaintiffs counsel in ALL the Fannie/Freddie cases– not just those being adjudicated in the Court of Claims– have access to those documents). The Court of Claims cases have been in process for almost three years now. You may recall that judge Sweeney permitted discovery in the Fairholme case in order to determine whether the fact pattern in that case gave her court jurisdiction over it. She still hasn’t ruled on that question (although I believe she will rule in the affirmative). This is relevant to the protective order because she has previously said (at least this is my recollection) that she wouldn’t release any of the documents produced in discovery and covered by the protective order unless and until she rules her court has jurisdiction in the case. (The seven documents she released on April 11 were an exception.) That’s why the documents remain under seal. Plaintiffs are somewhat at a disadvantage because of this situation, but there’s nothing they can do about it. And it’s not a huge disadvantage. Yes, it would be nice if more members of the teams could see and analyze the documents, but as I’ve mentioned elsewhere it’s not as if you need a secret decoding ring to understand the vast majority of them–they’ll be pretty clear on their face. For that reason, I don’t think having the documents remain under seal is a significant hindrance to plaintiffs’s counsel as they prepare their amended complaints. Finished your book last night Mr. Howard. I highly recommend “The Mortgage Wars” to all with an interest in this matter. I have spent hundreds if not thousands of hours now reading all the court cases and other sources of information on this farce by the US Government. Mr. Howard’s book is without question the most complete and informative source of the who what and when of why this all happened. I also have more respect for you Mr. Howard than ever. How in the world did you go through this without popping a fuse? Note to self… do not take Warren Buffet’s transportation while negotiating with him lol. Would be very interesting to hear your thoughts on Mark Calabria’s proposal for mortgage finance reform! 2. “Nor has the current system delivered gains in terms of homeownership.” Perhaps you could also comment on where you think the ‘natural’ homeownership rate in the US would be under the system that you proposed? 4. “A system where investors do not care about credit risk is one where toxic mortgages are not only allowed but encouraged.” Does the GSE system encourage the above described behaviour? If the alternative to the GSEs is a system where every holder of the mortgage (along Mark Calabria’s lines) does full credit work, would that drive up the cost of mortgages? 5. “Going back to an originate-and-hold model is likely the best avenue for expanding access to borrowers who are truly “creditworthy.” Do you agree with Mark that the originate-to-hold model does a better job at supplying credit, where credit is due? 6. Are the GSEs pro-cyclical as Mark suggests? Or is the ‘flight-to-safety’ if GSE MBS a stronger counter-cyclical force? Many thanks for letting me post here! I thought Calabria’s piece was thought-provoking. Rather than answer your questions about it one by one, however– which would take up a lot of space and probably be repetitive– let me rephrase them into two broad categories: (1) are more and cheaper financing the best ways to achieve optimal, stable and low-cost homeownership, and (2) to the extent that they are, is Fannie and Freddie securitization the best way to do that financing? On the first broad point, I understand the argument that lower-cost and more available financing can lead to both over-consumption of housing and higher prices for that housing. But rather than try to argue or defend against that possibility; I’d turn it around: if one believes that, aren’t there other public policy supports for housing that cost the government hard dollars that would be better to scale back first, before one restricts the availability or increases the cost of mortgage financing? For example (Realtors, avert your eyes) what about eliminating the mortgage interest deduction? On the efficiency of the securitization model, Calabria conflates what I call entity-based securitization–having actual companies guarantee and be on the hook for the credit risk in securitized loans–and structured finance securitization, where either credit rating agencies (in private-label securities) or “the market” (in risk-sharing transactions) evaluate, grade and price credit risk. There is no question that structured finance securitization failed catastrophically in the last downturn; I contend that entity-based securitization did not. Finally, why should we not rely exclusively on the “originate-to-hold” (or deposit-based) system, as Calabria seems to recommend? For one thing, that’s a risky way to finance 30-year fixed-rate mortgages. I disagree with Calabria’s dismissal of the thrift crisis (and there really were two of them) as a lesson of the dangers of the deposit-based system. He says the thrifts’ problems were due primarily to a lack of market discipline (caused by federal deposit insurance, which the banks obviously still have) and a “geographically fragmented system that lacked diversification.” In my view, however, the first thrift crisis (late 1970s) was caused by an interest rate mismatch triggered by deregulation of deposit ceilings, while the second one (late 1980s) was caused by the reaction to the first one: deregulating asset powers without adequate safeguards and supervision. Neither problem has changed since then. And I think it would be a mistake to go back to a mortgage system dominated by adjustable-rate mortgages, which are easier for banks to fund. The interest rate risk of a 30-year mortgage– be it fixed-rate or adjustable– has to be held by someone, and capital markets investors are much more efficient holders of fixed-rate mortgage risk (assuming the credit risk is taken out of the equation by a well capitalized and regulated entity-based guarantor) than homeowners are as holders of adjustable-rate mortgage risk. The economy benefits significantly from having capital markets investors, not homeowners, manage the interest rate risk on mortgages, and I believe we should design a future mortgage system that reflects and takes advantage of that fact. This article mostly ignores well documented causes of 2008 crisis. Instead it tries to focus on FnF as if everything else is working perfectly and it is only FnF system that is not perfect. If that were the case then why did financial establishment needed massive taxpayer subsidized bailout and why FnF conservatorship is still a mystery to almost all including the judges? 1. Article lacks any details on how author plans on implementing his wish list. This may be possible only when whole nation is brought under conservatorship. 2. Article uses gross mis-representations to support inferences. 3. Also there exist no connections between supporting explanations/assertions and the inferences. Author has totally missed great opportunity to present practical ideas to improve the system. I am having an argument with a hostile opponent to removing Fannie Mae from conservatorship. He claims that the DTA was not presented in 10-Q’s because no auditor’s certification is required in quarterlies and says the auditors must sign off on 10-K reports. The omission was obviously made by Fannie Mae’s team because there is just one group responsible for SEC filings, not some secret FHFA accountancy team that cook the books to serve its own, conspiratorial purposes up in the annual report. He thinks the DTA $50 B “item” was skirted by McFarland because she hoped a return to reported profitability would lead to R&R of Fannie Mae. In other words she didn’t want to shine a spotlight on the TRUTH that much of the profitability projected out by skirting tax liabilities with offsets from earlier losses… a huge reward for enormous losses in prior years. After reading the 10-K for 2015 and the historical perspective going back to 2013 in the management commentary on both performance and risk sections he claims the huge gains in 2012 were almost 100% the combination of DTA reversal entries and settlements with banks for single family loan improprieties. . . and if you back these items out, there was virtually no return to profitability except scaling back the reserves on the books for asset risk. Bottom line, he says the “sustained profitability” claim for a ten year pro-forma is a joke. No, your friend is not right. First of all, if you eliminate the non-cash expenses (mainly the DTA reserve, the excessive loss provisioning and the impairments on PLS holdings) in 2008-2011, Fannie was profitable (on an operating basis) even during that period. It became even more profitable in 2012-2015, as (a) the DTA reserve was released, (b) Fannie was able to charge its current period losses against its loss reserve rather than income, and (c) the values of its PLS holdings were written back up again (mainly as a direct increase in the equity account, as “other comprehensive income”). And going forward Fannie will continue to be profitable, as credit guaranty, net interest and other income will significantly exceed credit losses plus administrative expenses. McFarland was right in 2012, and she continues to be right. Your friend also misunderstands my point about the 10Qs and Ks and the deferred tax assets (DTAs). Whether or not Fannie discussed the DTAs in its quarterly reports had nothing to do with whether those statements are audited or not (and they aren’t); it had to do with whether Fannie (or FHFA) considered the DTAs a “critical accounting policy.” I find it curious that Fannie chose to consider the DTAs a critical accounting policy in each of the first three quarters of 2009, but then not at year-end, nor at any time until the fourth quarter of 2011, when suddenly they were again. I don’t know why that was, but if I had to guess I’d say it was a FHFA call, not the judgment of Fannie’s controller’s office (or its CFO). We know you have stated that FNF were not used to purchase or support toxic mortgage from PLMBS(private label mortgage back securities and HAMP/HARP was used to those loans guaranteed only by FNF. However per above report the number of loans modifications by FHFA using FNF are way too much of the estimated deliquency of about 2% for FNF. The estimate of delinquency of PLMBS is 18-20 % and the number of loan modifications in above report seems to support the theory that FNF was used to clean up toxic mortgage from PLMBS. Again thanks for your help to get the truth. “More than 21,100 foreclosure prevention actions were completed in February 2015, bringing the total to nearly 3.5 million since the start of the conservatorships in September 2008. Half of these actions have been permanent loan modifications”. Quote from the report. 3.5 million just for FNF? What happened to those homes guaranteed by the PLMBS? Who prevented their foreclosures? Financial institutions from Wall st.? I realize that there are theories floating around the blogosphere that FHFA used Fannie and Freddie to pay for loss prevention or loss mitigation activities on loans collateralizing private-label securities. For that to be true, however, not only FHFA but also Fannie and Freddie’s controllers staffs would have to have committed fraud. In the two posts above, you cite numbers you appear not to understand as if they were evidence the fraud theory is true. It isn’t. I looked at Fannie Mae’s Home Affordable Mortgage Program (HAMP) activity extensively in the research I did prior to writing my Perry Capital amicus. There was much I didn’t like about it. Primarily, I thought the (Treasury-defined) criteria for HAMP modifications (which were mandatory for Fannie and Freddie, but discretionary for banks) were too simplistic and mechanistic: they were formula-driven, and keyed not to negative equity but to debt-to-income ratios. That, in my view, caused the companies to modify far too many loans (and to write them down by too great an amount) compared with what it would have done had it been allowed to use its own modification criteria. These excessive HAMP modifications led to two types of losses. The first were temporary accounting losses. Because loan modifications were considered Troubled Debt Restructurings, Fannie used an extremely conservative “life of loan” accounting technique when it wrote them down, so that as of December 31, 2011, $35.1 billion of Fannie’s hugely excessive loan loss allowance stemmed from HAMP modifications alone. (Since the theory of a loan modification is that you do it to keep the loan from defaulting, at the end of 2011 Fannie had taken $35 billion in book losses on loans it theoretically didn’t expect to default.) The second type of loss from excessive HAMP modifications was in foregone interest income. At the end of 2011, Fannie had close to 250,000 HAMP modifications with an average payment reduction of close to $500 per month. That’s $1.5 billion in foregone interest income per year. If a third of the HAMP modifications were ill-advised– and I think that’s a conservative estimate– they were costing Fannie half a billion per year. Those are the real HAMP costs. I’ll say just a couple of things about your contention that the nearly 3.5 million foreclosure prevention actions cited in the February 2015 FHFA report are “way too much” just for Fannie and Freddie loans. First, I looked at the “Completed Foreclosure Prevention Actions” table on page 4 of that report, and it didn’t seem out of line to me (and I am very familiar with all of the categories in that table, and know what they are and how they work). Second, you can put the 3.5 million foreclosure prevention action number in context relatively easily. Between 2008 and 2015, Fannie’s cumulative credit-related losses totaled $98 billion. Since the average loss severity on these loans was a little over 30 percent, that means the total unpaid principal balance (UPB) of the loans that defaulted was in the range of $300 to $325 billion. At the end of 2011, Fannie’s average loan size was around $150,000, so if the defaulted loans were of an average size the $300-$325 billion UPB would have been associated with between 2.0 and 2.2 million loans. That’s only for Fannie. The 3.5 million loan figure for both companies thus does not seem “way too much” to me. Thanks for the clarification as far as the FNF is concerned. The next issue is what happened to those homes under PLMBS. Were they rescued? Who are the FI who rescued them? Was taxpayers money used? More power to you!! Did you hear anything from the group who asked you to write your proposal on what is the next step? I don’t really know what happened with the loans backing private-label securities. Loss mitigation for them was the responsibility of the servicers of those loans, and I don’t know what they did to try to minimize their losses. I have no reason to believe any taxpayer money was used for that purpose, however. The quote you cite above did not come from me, and it causes me to suspect you may be confusing me with the person who calls himself “timhoward717.” I have no connection with that individual or the website he manages. The group that asked me for a reform proposal was the Urban Institute. They told me that after all nine of their solicited proposals had been posted on their website (so far six of them have), they would “invite all authors to join in a Policy Debate with each other and Urban staff,” and also “consider holding a convening of the group to see if putting these ideas together in one place might also help catalyze solutions.” No dates were given for either of those steps, however. Tim , I think we all will appreciate that you write often about your proposal of 2% capital with plenty of explanations for this idea to grow roots in Congress. I mean “often” because the same thing has to be said often everywhere to pick up steam. Shelby is asking to GAO how much capital FnF need. They are asking to the wrong people! Mulvaney allies suggest that the Congressman is “flexible” on his capital figures–which I consider positive–in his legislation which is just beginning to get attention. I agree. I just finished reading it, and thought it was extremely well done. Excellent analysis and presentation. Your article is excellent. However you did not discuss about below important point made by Judge Millett. Judge Millett makes clear statements about what conservator is not allowed to do, applicability of 4617f. Could you comment on a question about the Fannie Mae 10Q? However in the recent oral arguments in the federal appeals case, the defendants seemed to argue that Fannie’s 10-Q from around this time period didn’t mention this huge DTA. To paraphrase the government’s argument, if she had this information and if Fannie was going to be so profitable, why it wasn’t disclosed in the 10-Q. Would GAAP require that the 10-Q disclose the upcoming $50 billion DTA? Does the CFO produce the 10Q? Thanks for your insight. Frank: Your question raises a number of important issues. I’ll give you my thoughts on some of them, while noting that others need to be probed further. Following the conservatorship, no important decisions were made at Fannie Mae that were not approved by FHFA. This includes decisions about accounting policies and entries. I have often wondered how Fannie’s accounting officers, and its CFO, reacted to and dealt with the avalanche of non-cash accounting entries that FHFA, following Treasury’s guidance, insisted that Fannie book. When I was CFO, I had to sign a Sarbanes-Oxley certification stating, among other things, that in each 10Q and 10K “the financial statements… fairly present in all material respects the financial condition, results of operations and cash flows of the registrant.” I checked Fannie’s 10Ks and Qs and found something interesting: they include CEO/CFO Sarbanes-Oxley certifications through the third quarter of 2011, then no longer do after that date (Freddie’s still do). I don’t know why that is, but it may well have significance. I then looked at 10Ks and Qs for statements about the deferred tax asset reserve, and found more interesting things. From the first quarter of 2010 through the third quarter of 2012, Fannie didn’t discuss its deferred tax assets (or the reserve against those assets) at all in its quarterly reports, only at year-end. Fannie also has been highly inconsistent, and seemingly arbitrary, as to when it has considered deferred tax assets to be a critical accounting policy. It did in its year-end 2008 10K and each of three quarterly 2009 10Qs, then removed deferred tax assets as one of its four critical accounting policies (the others being loss reserves, impairments, and fair value) in its 10K for the full year 2009. Deferred tax assets stayed out the “critical accounting policies” category (even though in my opinion it should have been there for as long as there was a reserve against them) until the 10K for 2012, when it suddenly reappeared again, after the net worth sweep was in place. All this as background for your question about the seeming discrepancy between Ms. McFarland’s statement to Treasury officials in August 2012 about Fannie’s profitability and the likelihood of the return of $50 billion in income from reversal of the DTA reserve, and the fact that these points were not noted in the 10Q for the second quarter of 2012. I believe this was because FHFA was the final arbiter of the 10Q, and it simply decided to stay silent on the DTA issue (which it could do because the DTA was not a critical accounting policy at that time, and it didn’t have to discuss it). When FHFA finally did address the DTA at the end of 2012, in the 10K, it finessed the information it had received from McFarland by using the following language: “Giving more weight to evidence that could be objectively verified [losses from prior periods] than to evidence that could not be objectively verified [Ms. McFarland’s statements and projections], we determined that the factors in favor of releasing the allowance were outweighed by the evidence against releasing the valuation allowance.” With that language, Fannie was able to keep the DTA reserve in place until the net worth sweep came into effect, at which point FHFA let Fannie release it (with the proceeds going to Treasury). Thank you for taking the time to explain this, I do appreciate it. Quick addendum. Someone emailed me to say that while Fannie stopped putting Sarbanes-Oxley certifications on the 10Qs and 10Ks they put up on their website at the end of 2011, the certifications still show up on all of Fannie’s 10Q and 10K filings on the SEC’s Edgar data base. I checked that, and they do. That still leaves open the question of why Fannie would have dropped them from the Ks and Qs on their own site. I don’t have an explanation for it. I asked this question as well a few weeks ago. Is it your belief that since Q4 of 2009 the DTA’s were not properly disclosed presumably at the behest of FHFA up until the net worth sweep? No, I wouldn’t say that. Fannie did disclose and discuss both its DTAs and the DTA allowance each year in the 10K– back in the “Notes to the Financial Statements,” under the income tax notes. But the fact that from the fourth quarter of 2009 through the third quarter of 2011 it chose not to consider its treatment of the DTA a “critical accounting policy” meant they didn’t have to discuss the DTA in the quarterly 10Qs at all, since there are no “Notes to the Financial Statements” in the Qs. I thought that was a curious decision, and it allowed them avoid highlighting what they were doing with the DTAs. It is best to get this clarified thru Ms. McFarland. However the answer can easily and reliably be guessed. We have seen under FHFA conservator, a consistent pattern of different versions of everything. One for public consumption another (real one) for internal consumption. All public financial statements were prepared under the direction of FHFA conservator for public consumption. The one prepared by Ms. McFarland were probably (real one) for internal consumption. What are your thoughts? Is this a reasonable amount of capital in your opinion? (1) Mulvaney’s legislation might say that Treasury can keep all senior preferred stock dividends received prior to the date of enactment of his bill, but the courts may determine differently. (2) I disagree with allowing Treasury to convert its warrants for 79.9 percent of the companies’ common stock, for both legal and practical reasons. Treasury granted itself the warrants in a self-dealing agreement, with neither the knowledge or consent of the boards of directors of the companies. The warrants are being challenged in some of the lawsuits, and I expect those challenges will be successful. Beyond that, if Treasury exercises the warrants, the proceeds would be removed from the mortgage finance system (and given to Treasury for whatever purposes it wishes). The five-to-one dilution of the companies’ common would make it much harder for them to recapitalize by issuing new common, since post-warrant exercise they would get only one-fifth the dollar amount per share issued as they would have had the warrants not been exercised. It’s more than a little odd how some reformers support “getting more private capital into the mortgage system” while at the same time supporting Treasury’s taking over $100 billion (by most estimates) OUT of that system by exercising warrants they had no real right to in the first place. (3) With the companies not released from conservatorship until they fully meet their 5 percent risk-weighted standard and Treasury’s exercise of the warrants, Fannie and Freddie would stay in conservatorship for at least 10 years, since that is how long it would take them to fully recapitalize themselves just from retained earnings. I believe there needs to be a path to get them back into normal operations and function much sooner that that. I read the Mulvaney bill too quickly, so let me amend my previous comment. The bill recommends a TEN percent total capital requirement, not 5– the 5 percent risk-weighted figure is the point at which the companies are released from conservatorship. Even with a 50 percent risk weight, which would bring Fannie and Freddie’s capital requirement down to 5 percent, that’s much too high relative to the inherent risks of the types of mortgages the companies traditionally guarantee (and are now guaranteeing again). Also, the restriction that the companies may not pay dividends on either common or preferred stock until they become fully capitalized (i.e., have 5 percent capital) will make it impossible for them to raise common or preferred stock in the public markets, leaving them to reach that full capitalization level through retained earnings alone, which would take them 20 years. For these and other reasons, the bill is not worthy of anyone’s support. i hear you with respect to your view that a net 5% capital requirement is excessive, and that a complete retention of retained earnings would make it impossible to raise new capital. i would simply add that the mulvaney bill also provides that the treasury senior preferred stock be deemed paid in full. if the NWS is simply invalidated and the excess of dividends paid over the 10% requirement is deemed a paydown of the preference, treasury would still be left with something like $50B of outstanding senior preferred between both GSEs. mulvaney’s bill as i read it involves a substantial give up by treasury, as compared to simply reverting to status prior to NWS. no tears for treasury as they will still have gotten their money back and about $40B more over the past 8 years, but this $50B give up (as i calculated it awhile ago) would make recapping GSEs, even if just by retained earnings, more manageable. You’re right, that aspect of the Mulvaney bill does work in favor of the company, compared with simply having the net worth sweep reversed. Something else that would make recapping Fannie and Freddie happen more rapidly is that a 5 percent capital requirement would cause Fannie and Freddie to have to raise their guaranty fees to about 95 basis points to earn a 12 percent (non-utility) after-tax return on that capital. I expect the companies’ annual losses on their new business will stay in the low single digits for the next several years (if not longer), so after their 9 basis points of administrative expenses over 80 basis points of their charged fees on new business will flow either into their loss reserve or retained earnings (after taxes). But I don’t view grossly overcharging homebuyers to build up capital that isn’t necessary to cover losses to be a plus for any proposal, including the Mulvaney bill. Tim, do you know if there are other DTAs remaining in Fannie or Freddie that could be used for recapitalization purposes……. Thank you so much for this blog. At the end of 2015, Fannie had $37 billion in net deferred tax assets (DTAs), and Freddie had $18 billion as of the same date. But these can’t be used to recapitalize the companies. Net deferred taxes arise when companies are required to pay more taxes by taxing authorities (in the case of Fannie and Freddie, the IRS, since both are exempt from state and local taxes) than they reflect on their books. For Fannie and Freddie, this happens because in many instances the accounting they use defers recognition of income (which is taxable) and accelerates recognition of expense (which reduces taxable income) relative to the standards set by the IRS for payment of cash taxes. The (positive) difference between cash taxes paid to the IRS and taxes provided for on their books is the DTA. The only way that comes down is for the difference between cash taxes paid and taxes provided for on the income statement (which are driven by book taxable income) to come down as well. There is no discretionary component to the DTA. As ruleoflawguy points out, the Mulvaney bill absolves both GSEs of their liquidation preferences. Liquidation preferences for both enterprises would currently still have a positive value, assuming 3A didn’t exist and applying excess dividends (NWS – 10% dividend) towards liquidation preference pay-down quarterly. If excess dividends above the original 10% in the original PSPA were used as a pay-down, then subsequent Treasury dividends would be reduced. As of the 2015 4Q payment (eff 3/31/16), Fannie would still have about $16 and Freddie about $8 billion left on their liquidation preferences. This doesn’t include the effect of interest on excess dividends Treasury has kept. So, under the Mulvaney bill, this goes away. Not saying I like the entire bill, but the liquidation preference pay-down aspect is a positive. There seems to be big confusion in courts about whether NWS is helping or hurting FnF and FnF shareholders . What is your thinking about this and what is the real truth? FHFA seized FnF and put them in to conservatorship with one set narratives and after that FHFA is doing exactly opposite of this stated narrative. In this context can you please explain how NWS can be used or misused by FHFA? Is there way to hold FHFA responsible for its all official announcements? Are there any reasons for courts to trust FHFA and allow FHFA to continue what it is doing? The only “confusion in [the] courts” over the net worth sweep (NWS) stems from Treasury’s claim that it entered into it to prevent Fannie and Freddie from having to undertake an endless cycle of borrowing to maintain their 10 percent dividends to Treasury. That contention fails for factual reasons plaintiffs counsel have made clear, and I have no doubt plaintiffs will prevail on this point. The only danger I see is the appellate court agreeing with the government’s legal interpretation that HERA grants FHFA in its status as conservator carte blanche to do whatever it wishes with the companies, irrespective of the language in HERA and other statutes defining the roles and duties of a conservator. The odds of an adverse ruling on that legal point, however, I believe are quite low. I don’t know of any way FHFA could “misuse” the NWS. I have become persuaded that the boards of directors of the companies, if they wished, could decline to declare NWS dividends to Treasury, but I wouldn’t call that a misuse, since the Preferred Stock Purchase Agreement gives them that power. So far, though, the companies’ boards have shown no signs of willingness to oppose actions mandated or requested by FHFA or Treasury that are not in shareholders’ best interests. Nor has FHFA–which is supposed to be an independent conservator–opposed any action requested by Treasury that depletes the companies’ assets (and there have been many such actions). There is every indication that Treasury and FHFA will continue to run Fannie and Freddie in their, the regulators’, own interest, and not the companies’ shareholders, until a court tells them such behavior is illegal. If you don’t want this posted here, I’ll understand. This will make more sense to those who’ve listened to yesterday’s proceedings. My hope and prayer is that these very sentiments would reach the panel before whom Olson recently appeared. Doesn’t it really come down to this? There can be no credibility to the defense’s claims as long as they refuse to amend the sweep. Justice Millett seemed to indicate (at least as a hypothetical viewpoint if not her own) that the NWS was favorable toward the GSEs at the time (but maybe not in hindsight) because it eliminated any dividend should there be no profit in any given quarter. She said something like, “you’ll only have to pay something if you have something you can pay.” That deal seems graciously accommodating on one level. It also eliminated circularity, what she referred to as taking from one pocket to put into another pocket. What I believe was absent from this depiction is the *implications* that arise from the relevant distinction between *something* and *everything. * The problem is not that the Tsy only required something when something could be paid, for what’s wrong with that? Rather, the problem is they perpetually require EVERYTHING when something can be paid. Big difference. As Olson noted, it is impossible to become sound and solvent if everything is swept. Ginsberg agreed. At best the government exercised “bad judgment,” yet certainly don’t mind living with the perpetual windfall of that bad judgment. Well, that suggests to me that it mightn’t have been bad judgment at all but more possibly a calculated screwing. It’s really that simple, isn’t it? If they’re unwilling to nullify the sweep to reflect payment in full, then why should anyone interpret the intent of the sweep in a less cynical light? It’s problematic to place the accent of the terms of the 3rd amendment on (i) the elimination of the requirement of a 10% dividend and (ii) requiring nothing when there’s nothing to be had. It’s problematic GIVEN the fact that the terms aren’t so much about not requiring a payment when profits aren’t made, but extorting *everything* when profits are made. That’s the glaring part of the NWS, precisely what has happened and what is now believed to have been known would surely happen. And to call that a return for risk taken is I believe most unreasonable. First, it’s becoming apparent that it was known at the time there was no risk. Secondly, the alleged risk would have been necessarily self serving. It was taken not to preserve shareholders but allegedly the entire nation’s economy if not the entire world’s. So, it would be unjust to penalize shareholders even if there was a risk. Lastly and most significantly is that risk is irrelevant under the terms of conservatorship. It’s an emotional consideration at best that has no place in these proceedings. It might be that the judges haven’t recognized much of this (given the hypothetical bunnie trail that was permitted to ensue), but I can’t be dogmatic on that point. The rest is rather clear, however. “I win you lose; or you lose I win” is the obvious corollary of NWS. Ron: I’ll leave your comment up, but at the same time note that this isn’t the best forum for this type of discussion, for a couple of reasons. First, I’d like to keep the site focused on ideas, facts and analysis, rather than exchanges of points of view on issues. Not that there’s anything wrong with the latter, and that’s my second point: there are other sites that specialize in open discussions and exchanges of points of view, and do a good job of it (and some that don’t do such a good job), so it’s better to begin those discussions there, where they can be developed, challenged and responded to. I haven’t listened to the recording of Friday’s oral argument yet, although I’ve read lots of commentary on it. From what I can gather, while plaintiffs’ counsel may have missed some opportunities to make their points better, or to challenge false premises behind some of the questions, they made no obvious commissions of error. That being the case, the record left by the written submissions will remain the primary basis for deciding the case. And that, in my view, strongly favors the plaintiffs. Thanks for the latitude and I concur with all your observations. I think this has been asked before but i would just like to ask since you mentioned that the decision of the Appelant Court will be based heavily on the submitted written arguments, would your submitted amici briefs be taken into account or be assessed upon? Because during the argument the judges were probing on any challenges to the original PSPA itself. Of which the Plamtiffs said no. But its becoming very clear that the 3rd ammendment is simply a second phrase of the ill-intended acceleration of the wind down of FnF after the PSPA which seeks to drain their capital. Its frustrating that when the legal system do not look into the whole big picture that any subsequent orders are only based on the limited grounds of argument, even though that’s how the courts proceedings function. The appellant judges (and their clerks) certainly had access to the amicus brief I submitted in the case last July, but it is unlikely they would have seen the amicus I prepared this February for submission in the Delaware case (which has been opposed by defense counsel, with the court’s decision pending). Still, the Perry Capital amicus gives the “big picture” context you call attention to. The clerks definitely would have read that amicus, and my guess is that the judges would have read it as well. I have not listened to the audio transcript of the oral argument, but I suspect the judges were asking whether the plaintiffs in Perry were challenging the PSPA, and they are not. The Perry Capital case in the DC Circuit, as well as the Fairholme suit in the US Federal Court of Claims, challenge only the 2012 net worth sweep. It is the Washington Federal case (in the Court of Claims) that challenges what I call “the takeover and the terms” of the 2008 conservatorship. I agree with you, however, that the entire scope of the government’s actions with respect to Fannie and Freddie are best understood when seen as a long series of actions, beginning before the 2008 conservatorships, to remove them as the foundations of the U.S. secondary mortgage market– an effort that continues to this day. Thanks Tim for your reply. It would be great if you have a chance to listen to the appeals and let us know how you feel about our chances. It only seems so logical that the court issue remedy and final judgement on the entire merits of the case, instead of just partial, as in the case here. I know it’s naive to think this way but isn’t this what’s the whole purpose of the judicial system is about? Justice and the truths. At the moment, listening to the transcript of the oral arguments in the Perry appeal isn’t near the top of my priority list (and I should add that I am following developments with Fannie and Freddie, and mortgage reform, out of a deep personal interest in the subjects, but still on a part-time basis; there are many other things I like to do in addition to monitoring these issues and managing this site). I’m a great believer in specialization, and I’ve read enough reports of the transcripts from people whom I believe have good experience and judgement to be confident that nothing was said during oral argument that hurt the case for the plaintiffs. The written arguments, in my view, argued strongly for the plaintiffs’ position, and I believe they well prevail. I am less certain what will happen after that, but if I had to guess I would say the judges would remand the case to Lamberth with guidance (from the appellate court) for how he should proceed with it going forward. I’m in support of the second half of your post, which expands on your recent mortgage financial system proposal. But the first half of this piece has me wondering… Specifically, “The fact that Treasury has not been truthful about its actions related to the takeovers of Fannie and Freddie and its subsequent management of the companies will come as a shock to most.” Many people, yourself included, have labored at getting the truth about the government’s actions out to the masses. Consider Micheal Lewis’ ‘The Big Short: Inside the Doomsday Machine’ realized great success, especially after the screenplay adaptation by Charles Randolph and Adam McKay turned into the Oscar-winning movie. There is evidently interest in these topics, especially when written and delivered in a compelling manner. Also, Bob Woodward and Carl Bernstein enjoyed success with their coverage of the Watergate scandal (many believe Fanniegate is an even greater scandal!). Here’s my question: Are you considering a follow-up to your book, ‘The Mortgage Wars’ that would expose this corruption, malfeasance and coverup? Josh Rosner yesterday posted a teaser tweet that hints at such an exposé as a sequel to “Reckless Endangerment: How Outsized Ambition…’ (I was assuming that Josh and Gretchen Morgenson had been working on this project given Gretchen’s numerous NYT pieces on the subject). The best outcome would be to realize the same level of success as the “The Big Short’ and ‘All the President’s Men’ movies. Netflix docudrama sprinkled with McKay-esque humor, perhaps? It’s time to take on the WS-DC propagandists and expose all of the bad players and exactly what they did. There is no place in our democracy for this type of wrongdoing. The bad guys shouldn’t be allowed to win… and future bad guys should be dissuaded from committing similar crimes. I haven’t really considered a follow-up book. 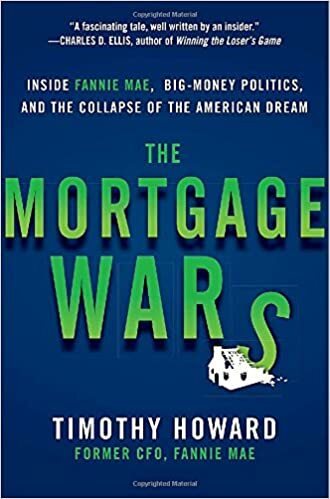 I wrote The Mortgage Wars because even after I had been kept away from the mortgage reform debate for many years by legal constraints (which were removed in 2012), I noted that nobody had accurately told the story of what actually happened with Fannie (and Freddie) leading up to and after the financial crisis. That story is now much better known, and many others are following up on it. I don’t know that I’d be the best person to write about what you call the “corruption, malfeasance and coverup;” there are others more qualified to do, and enthusiastic about doing, that. For now I think I’ll stick with doing posts on this website (and having meetings with key players in the process, both to benefit from their perspectives and to try to build support for a constructive outcome in the reform efforts). Thanks for the response. Perhaps “corruption, malfeasance and coverup” were not the best rephrase of your words “deception and dishonesty.” I realize you were referring to Treasury’s actions, while I was including the collusion of the greater Financial Establishment + USGov in Fanniegate. You’d be the better person to attest to what type of effort it takes to write a book, but even maintaining a blog like this is a huge effort. Not only writing the posts, but reading and responding to all of the comments…! This contribution re: getting the facts and truth out is of tremendous value and appreciated by many… in addition to your assistance with some of the cases and recent mortgage system proposal. Wow…I’m tired just thinking about that…! Can you tell us who these key players are? I don’t want to mention anyone by name. But I also don’t want to create the misimpression that I have some special network of people or that I’m working on a secret plan of any sort. Since my book was published, I have been corresponding and meeting with people whom I feel are open-minded and objective on issues related to mortgage reform. I believe both I and they have benefited from the dialogue and exchange of ideas that ensue from these contacts, so I’d like to expand the range of people with whom I have them. 1) If the prospectus says that securities issued by F/F are obligations of the USA– then your proposal is non-starter as it will require legislation. 2) If there is a full faith and credit guarantee, what risks are F/F share holders taking? Why should they get 40 basis points in G-Fees when the taxpayers are taking all the risks? GNMA securities have a full faith and credit guarantee and there are no GNMA share holders. Why not simply have GNMA expand their role? 3) Who sets the rate and amounts at what rate the Treasury will lend to the GSEs? By your own admission, losses would have exceeded worst case expectations. This is a classic trader’s dilemma. Do I hold on and assume the worst is over or do I get out assuming that the worst is yet to come? How does the Treasury know that they will get paid back? Shouldn’t the rate be determined by then existing market conditions? What if the GSEs need to borrow $100 billion at a rate of 5% ($5 billion in interest payments). What if the can’t meet that payment? Are they in default? Again, F/F were never intended to be the dominant force in the mortgage markets. The 1968 lines of credit arrangements did not envision Fannie with over $3 trillion in credit guarantees (they actually envisioned none). 4) if the prospectus has the same vague language that has been existence (on FNMA since 1981) that the securities are NOT obligations of the USA but there is this special relationship where the entities can borrow money from the Treasury (the rate and and amount will be decided at the time of borrowing!) — you have the same situation as prior to 2008. Then, as I have posted before, I am not sure what problem you are solving. I seriously doubt investors are going to be re-assured that, this time, the GSEs will only buy properly underwritten mortgages from honest originators. 5) I say this with all due respect, but I find it frightening that in 2016 there is a still a view that some central authority will be setting G-Fees. Again, the foundation of your proposal is that a combination of honest originators and a line of credit from the Treasury creates mortgage-backed securities that investors will perceive as having no credit risk. So what if these investors act irrationally and refuse to buy the securities for fear of credit risk? What if AAA securities are trading at 80 basis points spreads? Without a full/faith guarantee, F/F securities are something better than AAA but something worse than Treasury notes. F/F securities will start trading at discounts to offer higher yields. Originators selling in the TBA market are now getting charged a higher premium. This premium will be passed onto borrowers. Or the FED steps in and begins buying MBS. Deja vu. 6) The portfolio role performed by the GSEs was critical as there are few natural buyers of mortgage-backed securities. Right now, the FED has effectively performing that portfolio function. Who replaces the FED which replaced the GSEs as the largest buyers of MBS? Barry: You’re thinking about my proposal the wrong way. It’s not an untested new system that would have dangerous mis-incentives and “some central authority…setting G-fees.” It is a relatively modest variation on a mechanism and incentive structure– Fannie Mae, as it has existed as a shareholder-owned company for nearly fifty years–that in spite of a disinformation campaign to the contrary has worked exceptionally well. The main criticism of the old Fannie/Freddie model was the combination of implied government support and the profit motive of a shareholder-owned company. I change that in my proposal with the companies agreeing to accept capped returns in exchange for a pledge of government support should their capital fall below a level that the GOVERNMENT has agreed (that’s a critical feature of the proposal) should be adequate. And yes, should that amount of capital prove not to be adequate, the government would make a “cost-plus” loan to the companies so that they can weather the storm. It wouldn’t make them take non-repayable senior preferred stock at an after-tax dividend of 10 percent, or throw their senior management into a fire pit. I believe this plan can be put in place administratively (just as the takeover was done administratively), but for it to happen this or a future administration would have to WANT to do it, because it’s in the best interest of what I call the “homebuyer/taxpayer.” That’s not the case right now– most seem in thrall of a disastrous plan put forth by the Financial Establishment that would benefit itself at the expense of the taxpayer/homebuyer–but hopefully that will change in the future. You are a great avatar of doubting Thomas with many questions. But do you have any other alternative solutions? Then be prepared to answer million times more questions. In a real world there are no perfect answers for real problems. Here the challenge is to come up with a practical solution to help all the people at affordable cost and at minimum risks. The solution provided by Tim maximizes the positives for all and at same time minimizing the negatives. This seems to be the least disruptive solution. Most of your questions are hypothetical, because FnF are proven working systems. Even opponents of FnF agree that FnF system can not be replaced with anything else. That is why even after 8 years, nothing viable has come up. Tim’s solution tries to fix the perceived flaws and at the same time preserve the working parts as they are. You are missing many of these important aspects when you start asking questions. 1. FnF are private shareholder companies for public policy purposes without Gov Guarantees and without budget support. 2. Gov does not pay FnF for unfunded expensive social mandates, but does it indirectly thru tax incentives and preferential credit terms. Will any other private companies agree for such terms? 3. Gov created FnF for public policy purposes. If Gov wants to use GNMA to enter in to FnF business, it can do so and nobody is preventing it. Please tell us why Gov is not doing so. Other FIs are also free to do what FnF are doing and even more. But did not other FIs made big mess out of PLMBS and cause 2008 crisis? 4. Gov Controls/regulates FnF unlike any other private companies. Capital requirements need to be set, based on risk models. So the capital requirements tend to be far severe for FnF than other general purpose FIs. 5. FnF did not contribute 2008 in any significant manner. It is the other FIs that caused 2008 crisis and FHFA Conservator made it worse. Other FIs blamed FnF to shield themselves and get bailout money from congress. Are not other FIs still paying hefty penalties for the wrong things they did before 2008? 6. FnF were regulatory compliant and had enough capital, liquidity and profits to honor their financial obligations. Besides FnF could have raised more capital from markets thru borrowing based on AAA assets or selling AAA assets. FnF never needed conservatorship or SPSPA bailout. So people need to stop blaming FnF for wrong things they did not do. But in the bigger picture there is nothing unfair about this. Are other FIs any different? What useful purpose does it serve, just picking only FnF for blame? does much to give the reader a map of many details only someone in your position could know. You do a great job of giving the reader an easy read on a complicated matter. The current GSE issues make much more sense given the material you share in your book. For those who have not read Mr. Howard’s book I highly recommend you do so. Worth every penny and if for some reason you can’t purchase it at the moment it would be worth your time to check it out of you local library. You will have a much more clear vision of what is taking place right now. Thank you for your book and this blog Mr. Howard. You are an inspiration. This article not only gives a practical solution but also gives consequences of alternative proposals that are based on elitist ideologies. This article also builds on different thought processes to pick the best solution. Financial Establishment blamed FnF, caused seizure and conservatorship and burdened FnF with unwanted huge bailout. This was done not only to destroy FnF system but to divert the public attention from Financial Establishment and to get Financial Establishment much needed bailouts from reluctant Congress. They forced huge punitive bailout on FnF so that the bailout for Financial Establishment looked insignificant. Thanks for taking the time to write these intelligent posts. Do you have any thoughts on the recent Mulvaney Bill? I haven’t seen the text of any actual bill yet. I did read Rep. Mulvaney’s Facebook post about it, and it doesn’t appear that there’ll be too much substance to it. But we’ll see. Great read!! Thanks again for all your work Tim. Have a great weekend. Thank you for sharing your continual insights. From your experience, can you comment on what a “normalized” credit loss ratio would be for Fannie/Freddie? Do you think people are having a hard time conceptualizing the business because of the relatively high credit loss ratios since 2008? I’m trying to understand how to think about the loss ratios for the business given that not only is recent history clouded with an exceptional event, but also because of the “quality” problems on the origination side during this same time. Chris: Given the loan restrictions put in place by the Consumer Financial Protection Bureau, and Fannie and Freddie’s current mix of business, a conservative estimate of a “normalized” credit loss ratio for them would be 6 basis points per year. To put that figure into perspective, during the 15 years I was CFO at Fannie Mae (1990-2004) our average credit loss ratio was less than 2 basis points per year, and in all the time I was at the company (and indeed since it was spun out of the government in 1968) the highest its credit ratio ever got was 12 basis points, in 1987. That was after Fannie relaxed its credit standards in the early 1980s to attract more business, with mortgage rates in the mid-teens and needing income to offset losses from the mismatch in its mortgage portfolio; Fannie attracted a disproportionate amount of business from the oil patch states (which were doing relatively well when the rest of the country was in recession), only to see oil prices plunge, and oil patch state default rates soar, in the mid 1980s. You’re absolutely right that people are greatly overestimating what normalized credit losses should be on a traditionally underwritten mix of single-family mortgages because of the atypical loss rates posted in the 2009-2012 period. Even conservatively underwritten loans made during 2005-2008 performed very poorly subsequently, as home prices had been driven to unsustainably high levels during those origination years because of the avalanche of cheap credit made available through private-label securitization. And high-risk products like “liar loans,” interest-only ARMs with deep teaser rates, and loans with layered risks performed much worse. your criticism of “promising road” based on the relative benefits to the homeowner/taxpayer as compared to your utility proposal was brilliant. another real world test would be to line up the senior execs at pimco, blackrock etc and ask them whether they would buy the enormous amount of credit risk transfer securities that the non F/F plans require? of course not. they would buy guaranteed mbs, but the credit risk bearing securities? it is outrageous to believe that any proposal can be taken seriously that requires this enormous amount of private capital to be conjured up like nitrogen from the air. academics playing outside their sandbox once again. let’s leave magical thinking to the novelists and keep it out of the GSE reform discussion! Once again, yay you and boo them! Now if we just could stamp their foreheads with “FE” brands……..!! Exceptional and Brillant based on the experience of the one financial analyst I trust, Timothy Howard. ! !